Phishing seems to be getting more and more popular. This can only mean one thing - it's successful. 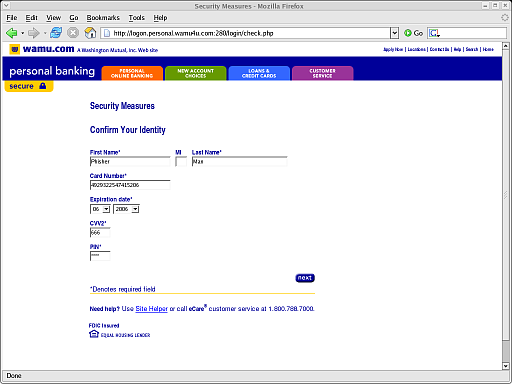 This page asks for your name, credit card information, and PIN. 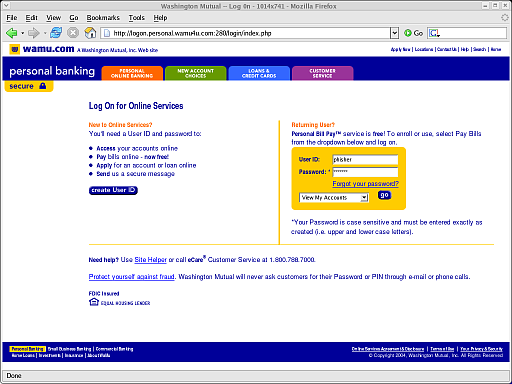 Once you provide this, you are redirected to http://www.wamu.com/personal/Welcome/Privacy.htm, a page within the legitimate Washington Mutual web site, possibly unaware that you've just given your personal information to a phisher. Because requests for http://wamu4u.com/ return a server error, and because the phishing attack utilizes port 280, it seems quite possible that the legitimate owner of the site is unaware. However, it sure does seem like these attacks would be very easy to track down. Does anyone know what the big targets (banks, eBay, Paypal, etc.) are doing to address this growing concern? What can we, as web developers, do to help?